Greyhound racing is an organized, competitive practice in which greyhound dogs are raced around a track. In some countries, such as Australia, Ireland, Macau, Mexico, Spain, the UK and US, greyhound racing is part of the gambling industry. The dogs are usually treated like machines. They start racing at 18 months old, and many don’t make it to the nominal “retirement” age of 4 or 5. Confined for up to 20 hours each day they barely have enough room to stand up or turn around. These dogs routinely suffer broken legs and other serious injuries. Many of them test positive for serious drugs, including cocaine. Hundreds of cases of greyhound cruelty and neglect have been documented worldwide. After racing, the best dogs are kept for breeding or sold to research labs while thousands of others are euthanized. 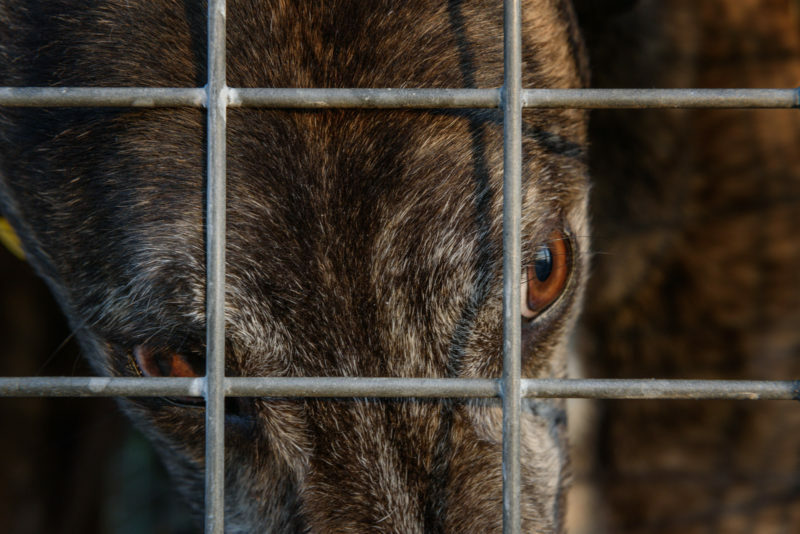 The numbers vary depending on the reporting organization, according to the racing industry 2,000 dogs are still euthanized annually in the US alone, however anti-racing groups estimate the figure at closer to 12,000. Many greyhound adoption movements have arisen worldwide to assist retired racing dogs in finding loving homes as pets. Volunteer, non-profit organizations and concerned animal lovers work hard to rescue and try to ensure that as many of the retired dogs as possible are adopted. Despite the abuses of the racing life, retired greyhounds are generally gentle and loving dogs. They are intelligent, loyal and good natured, it is easy to house train them and they rarely bark. For these reasons, after being rescued, some greyhounds become excellent service and therapy dogs for veterans who suffer from post-traumatic stress disorder, or others who have multiple sclerosis, traumatic brain injury, other health issues, and those needing mobile assistance. Also, greyhounds have a special physiological trait in their blood that is so unique that it can help save the lives of other dogs. There are eight different blood types in dogs but approximately 70% of greyhounds have the type that enables them to be universal blood donors. Greyhound blood differs from other dogs in that it has a higher red blood cell count, lower white blood cell count and lower platelet count. This has made Greyhounds valuable as occasional blood donors at veterinarian hospitals.